There is a huge difference between a desktop computer and a laptop. The differences are that a desktop is only used in one place it can be at home or if you are working in an office, it also doesn’t need to be recharged because it is connected to the power mains. A desktop also has lots of spare parts that are needed to be connected to the computer like e.g. 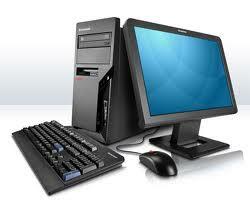 the main unit which stores all the data that you have in it, the monitor is the screen which allows the person to see all the data, the keyboard which allows putting input information on the screen such as, text, the mouse which allows to move the cursor on the screen and click on the data that you want. A laptop and a desktop are nearly the same in all functions, but the laptops are much smaller and can be taken out any where you go. Laptops unlike the desktop it needs to be charged using a charger and it also has a smaller memory than the desktop; all of the spare parts in the laptop such as the keyboard, the mouse, the speakers and the monitor screen are already built in so there is no need of cable.